Meals of light summer pasta salads, grilled ribs and seared shrimp were interrupted only by expeditions to the beach to search for crabs and shells, and carriage rides around Victoria. 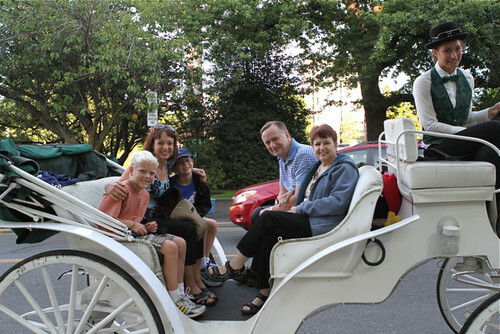 By the way, if you’re ever traveling through Beacon Hill Park in Victoria, by carriage or any other means, don’t miss the Beacon Drive-In for the best soft-serve ice cream you’ll ever taste. After returning home from Victoria, I couldn’t stop thinking about all of the fresh fruits and vegetables we ate while on holiday. When I spotted some ruby red plums at the market, the wheels started turning. Should I make a crisp? How about an ice cream? Ultimately, I decided to opt for something a little healthier. Plus, I didn’t have any ideas for dinner that night, so I knew I had to put on my culinary thinking cap. And so was born this whole wheat pasta salad, brought to life with the ripe, sweet plums, a light orange and cumin dressing and salty feta cheese. Some shredded chicken adds an extra hit of protein and sliced green onions and cilantro pump up the “freshness” factor. 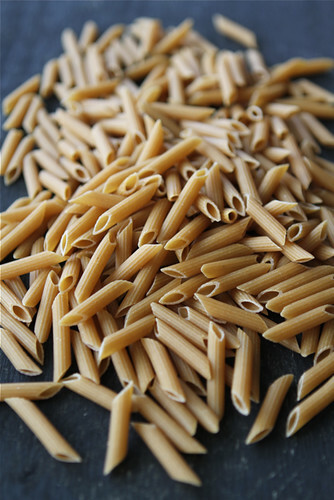 Are you thinking that plums, cumin and pasta sound like an odd combination? Well, I’ll just have to ask you to trust me on this one. The flavors will have you smitten. In a medium-sized bowl, whisk together the lemon juice, orange juice, olive oil, cumin, agave or honey, salt and pepper. Set aside. Cook the whole wheat penne according to the package directions. Drain and rinse with cold water. 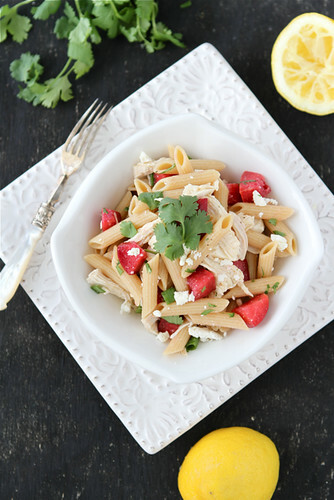 In a large bowl, combine the penne, shredded chicken, plums and feta cheese. Pour in the dressing and stir to coat the pasta. Add the green onions and cilantro and stir gently to combine. The dressing is adapted from a Cooking Light Magazine recipe. 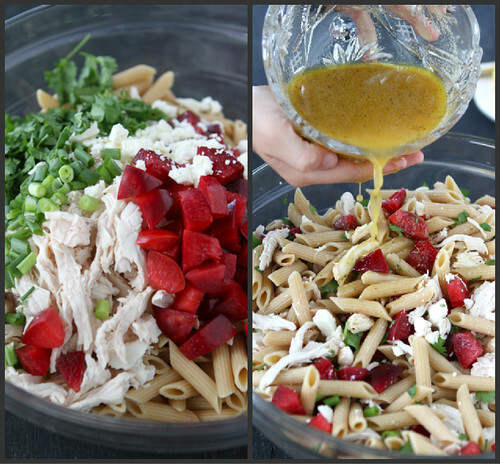 I love pasta salad recipes, especially with homemade dressing. I’ve never had one with plums, but now that you mention it, it sounds good! Yum, this looks so delicious! I love that there’s no mayo in the dressing, that’s what I never like about pasta salad – I’ll have to try this out for sure! This sounds wonderful! I love the idea that you put plums in the salad! Wow, I love this combination, how creative. Can’t wait to give it a go. Finally some of my fruit-intolerance-allergy issues are easing and plums are okay! If this tastes anything like the salad you brought yesterday, I know we’re all in for a treat. The plums and the cumin went so nicely together! 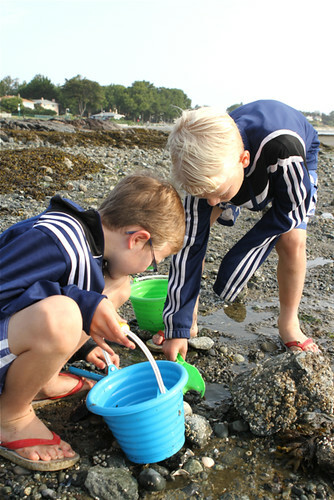 Looking forward to seeing photos of your parents yard! 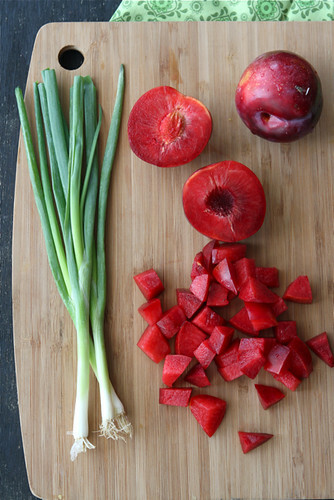 I love the idea of tangy-sweet plums in this salad! This is a great! I love the idea of using plums in a pasta salad! a very creative use for plums. looks tasty! What a creative way to use plums. I’ve never seen them in a pasta salad before. What fun family time! I love buying produce from farm stands and farmer’s markets and am psyched that plums are finally ripening up! 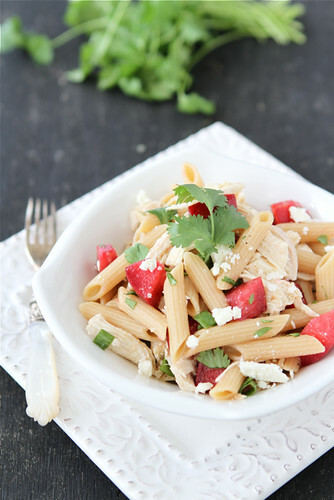 Your chicken pasta salad sounds satisfying and well balanced and clever to boot with the plums! Interesting combination which I will have to try! Love the photos and it looks like a fun time was had by all. I miss Farmer’s Markets. Don’t see too many in Houston. This pasta looks amazing and the flavors sound delicious. Saw this recipe and the only thing I was missing was the plums and feta…went to the store and picked up those items….SO delicious! My 2 year old loved it as did the adults! Great recipe. Sounds healthy, and flavorful. Some of my favorite recipes involve savory dishes with fruit. It adds such a wonderful touch! Love this. Hey Dara, That is a beautiful bowl of pasta! It’s been a crazy summer for us and I’m ready to get back on a normal schedule. I miss keeping up with you! Oh Dara, I love hearing about your family visit!! This pasta would be welcomed at m house any time 🙂 come visit!! Such an unusual combination of flavors in this pasta salad, but I can only imagine how wonderful they are all together. So glad to see that your family had a nice time visiting with your parents. Sounds like you had so much fun! And what an awesome recipe… I’m definitely smitten 🙂 I love that you added plums… I need this salad STAT!